Non-rapid eye movement (NREM) sleep is characterised by reduced consciousness; thus, studying its neural characteristics acts as a useful indication of what is needed for conscious experience. The integrated information theory (Tononi, 2008) states that the ability of different thalamocortical regions to interact is crucial for consciousness, thereby motivating research concerning connectivity changes in the thalamocortical system that accompany changing consciousness levels. This review aims to discuss investigations of functional connectivity of resting-state and large-scale brain networks, applying correlational approaches to neuroimaging data as well as studies that used brain stimulation to investigate effective connectivity. Most findings suggest a reorganisation of functional brain networks where inter-region connectivity is reduced and intra-region connectivity is stronger in deep sleep than wakefulness. The ability to generate consciousness is an essential property of the human brain, yet the specific neural mechanisms that generate consciousness remain unclear. The only time consciousness fades naturally in a healthy individuals is during deep (dreamless) sleep; this is shown by the frequent inability to recall any mental activity following awakening from this phase (Tononi, 2008). A considerable amount of recent research has therefore focused on what it is about deep sleep that makes consciousness fade, as a way of trying to identify the aspects of brain function that bring about conscious experience. 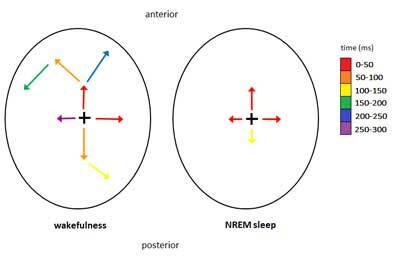 Sleep researchers traditionally divide sleep into NREM and rapid eye movement (REM) stages. Sleep onset, or N1, is the transition between wakefulness and sleep. After N1, NREM sleep progresses into stages N2 and N3, where it deepens (Nir, Massimini, Boly, & Tononi, 2013). N2 is marked by further disengagement from the environment and is considered stable sleep, unlike N1 (Spoormaker et al., 2010). Stage N3 is also known as deep sleep, or slow-wave sleep (SWS). The threshold for awakening is highest in this stage, and, upon awakening, people are quite likely to remain disoriented for some time. After N3, sleep lightens and reverts back to N2 and then into the REM stage, after which NREM and REM stages alternate throughout the night (Nir et al., 2013). Another classification system subdivides NREM sleep into stages S1-S4, with S1 representing the transitional state between wakefulness and sleep and S3 and S4 representing slow-wave sleep (Moser et al., 2009). Both classification systems are referred to in this review, adhering to the one used in each of the studies discussed. The electroencephalography (EEG) signal recorded in the different stages of NREM sleep differs markedly from that obtained in wakefulness or REM sleep and reflects the changes in cortical neuron firing across sleep. EEG can therefore be used to identify sleep stages (Nir et al., 2013). In wakefulness and REM sleep, the EEG signal is characterised by low-amplitude, high-frequency waves, while the EEG of SWS is characterised by so-called slow waves of low frequency and high amplitude. These are thought to reflect alternations in the membrane potential of cortical neurons, termed slow oscillations (Steriade, Timofeev, & Grenier, 2001). Virtually all cortical neurons in SWS continuously switch between a hyperpolarized (‘down’) state, where they exhibit almost no synaptic activity, and a depolarized (‘up’) state, during which they fire at very high rates that are often higher than in wakefulness (Massimini, Huber, Ferrarelli, Hill, & Tononi, 2004). The slow oscillation is likely due to reduced levels of neuromodulators (Steriade et al., 2001). Sleep is characterised by a marked reduction of consciousness. Consciousness can be seen as having two components: arousal (or wakefulness) and awareness, which can be further broken down into awareness of the external world and self-awareness (Boly et al., 2008). While there is neither any wakefulness nor external awareness throughout the sleep cycle, dreaming represents a form of conscious experience which occurs during sleep. Studies of conscious experience during sleep typically collect subjects’ reported recall of the mental activity that occurred just before being woken from various sleep stages (mentation reports); such reports consist of everything subjects remember going through their mind before being awakened (Nir et al., 2013). Vivid and relatively long reports of dreams are usually obtained from the majority of REM sleep awakenings (Massimini et al., 2005). When awakened from N1, subjects often report dream-like imagery (Nir et al., 2013). Interestingly, in deeper NREM sleep, especially in SWS in the first part of the night, mentation reports are much less frequent (Suzuki et al., 2004), and often blank or very short. This suggests that the subjects were unaware of themselves or their environment and indicates a marked reduction in consciousness level in this stage (Massimini et al., 2005), although there is a debate regarding the exact proportion of NREM awakenings that yield recall of mental activity. For example, Noreika, Valli, Lahtela, and Revonsuo (2009) used a serial awakening paradigm (awakenings repeated approximately every 24 minutes), and found that approximately 30% of early-night NREM awakenings resulted in dream reports with content. However, serial awakenings interfere with normal sleep cycles and do not permit subjects to reach sleep stages beyond S3 (S4 and REM sleep). There is also potential for the blending of dream reports from successive awakenings (Noreika et al., 2009). In general, sleep studies performed using various paradigms show notable differences in the length and content of mentation reports between NREM and REM sleep, with deeper-stage NREM reports being less frequent, up to four times shorter (Stickgold, Malia, Fosse, & Hobson, 2001), less vivid and poor in content complexity (Suzuki et al., 2004; Noreika et al., 2009) compared to REM. Subjects awakened later in the night provide longer mentation reports even from NREM sleep (Stickgold et al., 2001); however, this can be accounted for by the fact that NREM sleep later in the night is lighter, with almost no slow-wave activity (Nir et al., 2013). The relationship between mentation reports and brain activity across sleep stages supports the suggestion that there are systematic changes in brain function underlying the fading of consciousness during deep sleep. At present, the main candidate for a mechanism important for the maintenance of consciousness is cortical connectivity (Tononi, 2008). Cortical connectivity is central in several theoretical approaches to consciousness (and cortical functioning in general); the most informative of these, in terms of making hypotheses regarding the neural characteristics of levels – as opposed to contents – of consciousness, has been the integrated information theory (IIT), developed by Tononi (2008) and recently revised by Oizumi, Albantakis, and Tononi (2014). According to IIT, consciousness is generated by interactions among brain regions, which must work together as an integrated system (integration), and the ability of the neurons to generate a repertoire of different states (information, or differentiation). The thalamocortical system seems to fulfil these conditions, as it has many specialised regions that are also functionally and anatomically connected (Oizumi et al., 2014). The IIT predicts that a state of reduced consciousness (such as deep NREM sleep) should be marked by the brain’s inability to integrate information – in other words, by a reduced ability of brain areas to communicate with each other (Tononi, 2008). The theory draws on the earlier ‘dynamic core’ hypothesis, which proposes that a conscious percept requires the involvement of a functional cluster of neurons that dynamically changes its activity (Tononi & Edelman, 1998). In recent years, IIT has been used as a theoretical basis for investigating cortical connectivity changes across consciousness levels in a number of studies. Cortical connectivity changes in sleep have been studied extensively using a variety of techniques, but their relation to consciousness is still not fully understood. The identification of mechanisms underlying the loss of consciousness in NREM sleep may therefore help to understand what processes are necessary and sufficient for the maintenance of consciousness in general (Tononi & Massimini, 2008). This review focuses on recent studies investigating changes in corticocortical and thalamocortical connectivity between wakefulness and NREM sleep (or REM sleep and NREM sleep). Studies investigating connectivity using correlational approaches to neuroimaging data are considered, followed by a discussion of studies employing perturbation of the cortex at different consciousness levels. Finally, tentative conclusions and unresolved issues are identified. Functional connectivity is a measure based on temporal correlations between distant neuronal events, and it serves to investigate the integration of functionally specialized brain areas (Lee, Harrison, & Mechelli, 2003). In the studies discussed in this section, functional connectivity was assessed using blood-oxygen-level-dependent (BOLD) functional magnetic resonance imaging (fMRI). The BOLD signal is an indirect measure of brain activity, reflecting a decreased amount of de-oxygenated blood in brain vessels following increased neuronal activity (Fox & Raichle, 2007). In all studies cited below, EEG was used simultaneously with fMRI to categorise sleep stages. A number of studies in this area focused on default mode network (DMN) connectivity. The DMN is a network of brain regions implicated in self-related awareness (Greicius, Krasnow, Reiss, & Menon, 2003). During BOLD fMRI studies in the resting-state paradigm (where subjects are simply asked to lie awake in the scanner and refrain from goal-oriented cognitive activity; Fox & Raichle, 2007), correlated spontaneous BOLD signal fluctuations have consistently been found between these areas, leading to the proposal that they are functionally connected (Greicius et al., 2003). These correlations were also shown to reflect structural connections in the brain (Greicius, Supekar, Menon, & Dougherty, 2009). The DMN is typically reported to include the following areas: the posterior cingulate cortex (PCC), medial prefrontal cortex (MPFC), anterior cingulate cortex (ACC), inferior parietal lobules (IPL), hippocampal formation (HF), and inferior temporal gyrus (ITG) (Buckner, Andrews-Hanna, & Schacter, 2008). However, some areas, such as the HF (Greicius et al., 2003), ITG (Koike, Kan, Misaki, & Miyauchi, 2011), and also the thalamus (Vanhaudenhuyse et al., 2010), are not consistently reported in the literature. Although the DMN is only one of several resting-state networks (networks which show consistent activation in the resting-state paradigm; other networks consist of regions previously known to be involved in certain functions such as visual and auditory processing or language; Damoiseaux et al., 2006), it has been extensively studied in relation to consciousness as it is activated during self-related and internal processes and is thought to reflect self-related awareness (Buckner et al., 2008). If DMN connectivity reflects the level of consciousness, then it should be impaired in NREM sleep compared to wakefulness or REM sleep (Koike et al., 2011). The studies discussed below tested this hypothesis. Initial studies focused on the transition from wakefulness to sleep, and on light NREM sleep. Horovitz and colleagues (2008) studied DMN functional connectivity (using EEG-fMRI) in wakefulness, N1, and N2 in 14 non-sleep-deprived subjects, and analysed their BOLD fMRI data using a seed region correlation method. Seed region correlation methods are used to calculate correlations between BOLD fMRI signals from different brain areas. A region of interest (‘seed region’) is defined by the investigator (based on previous knowledge or theoretical assumptions), and correlations of BOLD time courses of all remaining regions with the seed region are calculated (Duyn, 2012; Fox & Raichle, 2007). From this data correlation maps are constructed, showing which brain regions are functionally connected, forming a network (Fox et al., 2005). Horovitz and colleagues (2008) found that the DMN remained active in light sleep, and correlations between all its regions persisted, i.e. there were no changes in connectivity. It was therefore concluded that the DMN is not linked to consciousness level. Larson-Prior and colleagues (2009) observed DMN connectivity in 10 participants from wakefulness to N2, also using a seed-based analysis. In agreement with Horovitz and colleagues (2008), they found no significant changes in DMN connectivity across conditions. However, only a small number of subjects in both studies were able to reach sleep. Due to the limited sample sizes, the statistical power of the studies may not have been high enough to detect small differences in connectivity (Larson-Prior et al., 2009). For this reason, Larson-Prior and colleagues (2011) employed the same methodology but increased their sample size and found dissociation between posterior and anterior parts of the DMN as early as N2. This work was continued by Horovitz and colleagues (2009) who reasoned that DMN connectivity, if it is reflective of consciousness level, should be significantly impaired in SWS, when consciousness is assumed to be most reduced, rather than in light sleep. They collected fMRI/EEG data from 18 participants after 44 hours of total sleep deprivation. The long sleep deprivation was used to ensure that all subjects could reach deep sleep in the scanner. A seed-based method was employed to analyse the data (data from 12 participants were of sufficient quality to be included in the analysis). In SWS, decoupling of the frontal cortex from the rest of the DMN was apparent, compared to wakefulness, across all subjects (Horovitz et al., 2009). The temporal evolution of DMN connectivity was also observed directly in one participant over three hours. All regions implicated in the DMN remained active during SWS, but correlations between its frontal and parietal regions diminished, while correlations between left and right parietal areas increased. The authors concluded that DMN connectivity strength is affected by consciousness level, and in deep sleep, DMN integrity is compromised; therefore DMN connectivity differences may underlie the loss of consciousness in deep NREM sleep (Horovitz et al., 2009). Interestingly, in an earlier study, correlations among some brain regions found in the human DMN were observed in macaque monkeys under general anaesthesia; this would suggest that preservation of DMN connectivity is not necessary for consciousness and that the DMN may not reflect conscious thought (Vincent et al., 2007). This result is contrary to the conclusion drawn by Horovitz and colleagues (2009). It is, however, difficult to make a direct comparison as not all regions of the human DMN have been found to have a corresponding region in the macaque brain. Therefore this discrepancy could be due to species-specific differences (Vincent et al., 2007). Sämann and colleagues (2011) aimed to extend the previous findings and performed a simultaneous fMRI/EEG study during the transition from wakefulness to SWS in 25 subjects. Data were analysed using a seed-based method as well as independent component analysis (ICA). ICA is a data-driven method used to directly extract the correlation map of a functional network from the fMRI BOLD signal by separating signal from the activated brain regions from non-neuronal physiological noise (Cole, Smith, & Beckmann, 2010). Total DMN correlation strength was highest in wakefulness and lowest in deep NREM sleep (Sämann et al., 2011). DMN connectivity was preserved even in SWS (and the whole DMN was traceable throughout the entire wakefulness to SWS transition), but there were changes in the strength of connections across sleep stages. In contrast to Horovitz and colleagues (2008) and Larson-Prior and colleagues (2009), Sämann and colleagues (2011) found a significant decrease in posterior DMN connectivity to the rest of the network in the transition from wakefulness to S1. This is likely a real effect as previous experiments had lower statistical power due to their small sample sizes. Sämann and colleagues (2011) concluded that DMN connectivity shows changes which are dependent on consciousness level and may be related to the loss of consciousness in NREM sleep. None of the previous studies, however, attempted to compare the changes in DMN connectivity between NREM and REM sleep, and this was the main motivation for Koike and colleagues (2011). They hypothesised that if DMN connectivity strength is related to consciousness, and is impaired in deep sleep, then it should be restored in REM sleep. Using a seed-based analysis of fMRI-BOLD data, they studied changes in DMN connectivity across the entire sleep cycle, which required their 12 participants to sleep in the scanner for two consecutive nights. The DMN was preserved even in deep NREM sleep, and connectivity between its core regions was robust across all examined levels of consciousness (Koike et al., 2011). 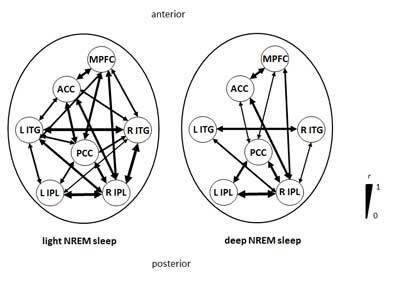 The connectivity between its subsystems, however, was significantly weaker in deep NREM sleep than in other stages (see Figure 1). Core regions are those consistently reported as part of the DMN across studies (here PCC, ACC, IPL), whereas subsystems (here MPFC, ITG) do not always show strong connectivity (Koike et al., 2011). ITG connectivity was lost in deep NREM sleep and regained in REM sleep. However, Koike and colleagues (2011) concluded that this does not show the importance of ITG for consciousness, due to its lack of consistent connectivity with the rest of the network in wakefulness. Therefore, while DMN connectivity undergoes some changes at different consciousness levels, these were interpreted as not being directly related to the reduction of consciousness in deep sleep in this study (Koike et al., 2011). This result is contrary to that of Horovitz and colleagues (2009), who report a loss of MPFC connectivity in deep NREM sleep. Koike and colleagues (2011) suggest that the differences lie in participant sleep deprivation. Their participants were not sleep-deprived, while Horovitz and colleagues (2009) collected data after 44 hours of sleep deprivation. Two recent resting-state fMRI studies found a reduction in functional connectivity following partial (Sämann et al., 2010) as well as total sleep deprivation of about 24 hours (De Havas, Parimal, Soon, & Chee, 2012), suggesting that sleep deprivation may, in itself, affect DMN connectivity. In some of the previous studies (for example Sämann et al., 2011) participants were partially sleep-deprived (required to get up three hours prior to their usual waking time on the day of the experiment), which may have also had consequences for functional connectivity if sleep deprivation indeed affects connectivity. Functional connectivity between DMN regions in deep and light NREM sleep. The right panel shows reduced functional connectivity between DMN subsystems, but not core regions, in deep NREM sleep compared to light sleep. Arrows represent positive correlations between individual DMN regions (circles), line thickness indicates correlation strength. DMN core regions: PCC - posterior cingulate cortex, ACC - anterior cingulate cortex, IPL - inferior parietal lobules (left and right); DMN subsystems: MPFC - medial prefrontal cortex, ITG - inferior temporal gyrus (left and right). Adapted from Koike and colleagues (2011), with the author’s permission. As mentioned above, several other networks can be extracted from BOLD signal fluctuations, including sensory (such as visual, auditory, sensorimotor) and higher-order cognitive networks (Larson-Prior et al., 2009), which constitute an ‘anti-correlated network’ (ACN), so-called as its activity is negatively correlated with DMN activity (i.e. it shows task-induced activation). The ACN overlaps with two attention networks (Sämann et al., 2011), and is thought to reflect external awareness (Boly et al., 2008). Therefore, some of the studies discussed above also investigated changes in connectivity in various non-DMN resting-state networks. For example, Larson-Prior and colleagues (2009) observed five sensory and cognitive networks and found no significant connectivity changes in the transition from wakefulness to N2, with the exception of decreased ACN connectivity which was expected, given its association with external awareness and the fact that external awareness diminishes in the transition to sleep. Larson-Prior and colleagues (2011) found reduced anti-correlations between DMN and external awareness networks in N2, with some local changes in individual networks in N1. Sämann and colleagues (2011) also studied the ACN and similarly observed a decreased DMN/ACN anti-correlation and a partial decrease in connectivity among ACN regions in SWS. The above findings generally point to the DMN being largely preserved in sleep and therefore not directly related to the loss of consciousness. However, in deep sleep there are changes in connectivity strength, most commonly frontoparietal dissociation (Horovitz et al., 2009). There are discrepancies between the findings concerning light NREM sleep, likely influenced by statistical power and data analyses employed. Sensory and attentional resting-state networks in sleep have not been as extensively investigated, but a decreased anti-correlation of DMN/ACN is a common finding (Sämann et al., 2011). Rather than concentrating on specific networks within the brain, several studies have focused on large-scale brain network analyses, assessing general cortical connectivity beyond the DMN, following the hypothesis that consciousness is a property of the entire thalamocortical system (Tagliazucchi, Behrens, & Laufs, 2013c). Spoormaker and colleagues (2010) used graph theoretical analysis of EEG/fMRI data in 25 participants to separately assess corticocortical and thalamocortical connectivity in deep sleep and wakefulness in a large-scale whole-brain network, i.e., not limiting the analysis to specific brain networks such as the DMN. Graph theoretical analysis is used to examine the overall structure of the cortical network. It processes BOLD temporal correlations and depicts the network as a graph composed of nodes (representing brain regions) with edges of different lengths (representing functional connections) between them (Bullmore & Sporns, 2009). The human brain network in the resting state has been characterised by having a so-called ‘small-world’ topology, meaning that different areas are functionally specialized, while being heavily interconnected (Spoormaker et al., 2010). General corticocortical connectivity was found to increase in light sleep and decrease in N2 and SWS. Thalamocortical connectivity diminished in N1 and was partially restored in N2 and SWS. Connectivity reduction was most apparent in long-range connections, and changes were accompanied by a shift of the structure in SWS away from the typical ‘small-world’ network to one with fewer long-range connections and more functionally segregated modules. Such organisation was shown to hinder functional integration; this may be related to loss of consciousness (Spoormaker et al., 2010). Spoormaker, Gleiser, and Czisch (2012) extended this work by specifically examining the integration of fronto-parietal networks during all NREM sleep stages. They saw reduced fronto-parietal connectivity beginning in N1 and continuing further into deep sleep. Furthermore, there was a reduction in thalamus connectivity with the rest of the network in N1, in line with Spoormaker and colleagues (2010). Tagliazucchi and colleagues (2013a) studied cortical connectivity with an emphasis on long-range functional connections in 63 non-sleep-deprived subjects and also observed decreased frontoparietal temporal correlation in deep sleep. They concluded that there is a reduction in functional integration in this state of consciousness. These results point to a general impairment of functional connectivity on the level of the thalamocortical system as a whole, possibly underlying the reduction of consciousness (Tagliazucchi et al., 2013a). A potential limitation of the studies discussed above is that they did not involve obtaining subject mentation reports in the sleep stages of interest. Reports of no mental activity in SWS would increase the confidence that participants’ consciousness was indeed diminished; this, however, adds difficulty to the data collection process (Tagliazucchi et al., 2013c), and most studies therefore rely on sleep stage categorisation using EEG and making inferences about the level of consciousness based on the EEG signal, as established in previous research. A slightly different approach was used in a recent experiment conducted by Boly and colleagues (2012b). They employed a hierarchical clustering analysis method to assess brain network integration. Hierarchical clustering is a model-free method whereby many seed regions from the BOLD signal are transformed into clusters, depending on how closely functionally related they are. The clusters are represented in a map that enables the visualization of relationships between a large number of brain regions (Fox & Raichle, 2007). EEG/fMRI data were collected in NREM sleep in the first half of the night. The authors first extracted six different resting-state networks with ICA and analysed them by calculating a measure called functional clustering ratio, or FCR (Boly et al., 2012b). FCR refers to the proportion of interactions within each subsystem, relative to between subsystems. The higher the FCR, the more interactions exist within subsystems, compared to between subsystems, and the higher the modularity of the network. The hypothesis was that during NREM sleep brain modularity would be increased, reflecting the decrease in interaction between regions. Boly and colleagues (2012b) found a marked increase in interactions within (as opposed to between) subsystems in NREM sleep compared to wakefulness. This signifies increased modularity in NREM sleep (i.e. functional segregation of the different brain modules). The results are in line with IIT, as an increase in brain modularity should impair the brain’s ability for functional interactions (Boly et al., 2012b). The authors also collected mentation reports, and all subjects reported no conscious experience prior to being awakened from NREM sleep, which provides a verification of the assumption that participants were in a state of reduced consciousness during this stage, and adds to the credibility of the postulated inverse relationship between brain modularity and conscious state. These results were recently replicated and extended by Tagliazucchi and colleagues (2013b), who partitioned NREM sleep into stages N1, N2 and N3 and investigated each stage separately, unlike Boly and colleagues (2012b) who also categorised sleep stages but analysed the NREM data as one data set. Reorganisation of modules was observed in N2 and N3, and modularity decreased immediately after participants were awoken (Tagliazucchi et al., 2013b). Spoormaker and colleagues (2010) also examined modularity in their study and reported an increase in local clustering in SWS, in line with the previously discussed studies (Tagliazucchi et al., 2013b). Taken together, these findings suggest that during deep NREM sleep, functional integration in the cortex is reduced. The functional connectivity studies presented here bear a few limitations. First, all of the work discussed above was conducted with healthy young adults, and the DMN, as well as other resting-state networks, has been shown to change across human development (Sämann et al., 2011). A strong age-related decrease in DMN functional connectivity was found in older adults in the anterior-posterior correlations (Andrews-Hanna et al., 2007), while in children of 7-9 years, the connections between most DMN regions were sparse (Fair et al., 2008). These observations raise doubt about the hypothesis that DMN connectivity is directly related to consciousness as no consciousness impairments in the healthy older adults or young children were observed in the studies above (Sämann et al., 2011). There are also general difficulties with studying sleep using fMRI, as subjects have to sleep in a noisy, uncomfortable environment, where they are less likely to reach SWS and REM sleep (Spoormaker et al., 2010). For this reason, they are often required to be sleep-deprived (Horovitz et al., 2009), but the exact effect of sleep deprivation on cortical connectivity is unknown, as discussed above. Studies not involving sleep deprivation may therefore allow more certainty that the sleep-associated connectivity changes observed under experimental conditions are representative of those in regular sleep. Another potential issue is the origin of the synchronised BOLD fluctuations in the brain. Horovitz and colleagues (2009) previously proposed that in the DMN these fluctuations may be mediated by some third region and suggested this might be the thalamus. The exact relationship between the thalamus and the DMN is unknown (Horovitz et al., 2009) as the thalamus has not been consistently reported as being part of the DMN in the literature (Vanhaudenhuyse et al., 2010) and therefore it is not covered by the MRI scans in many functional connectivity studies. Thalamic disconnection from the large-scale brain network appears to be linked to the process of falling asleep (Spoormaker et al., 2010), and the thalamocortical system as a whole is implicated in the theories underlying consciousness research. To clarify the role of the DMN in consciousness, and the significance of the thalamus for the network, further functional connectivity studies including the thalamus may be helpful. Finally, an important limitation of functional connectivity analyses is the inability to infer causality from the data, as the results are based on temporal correlations which may not reflect causal interactions (Lee et al., 2003). To gain knowledge about causal interactions, studies of effective connectivity, such as those described below, can complement those measuring functional connectivity (Lee et al., 2003). Effective connectivity is a measure which enables investigation of the influence that one neuronal system has over another (Lee et al., 2003), and therefore provides information about causal interactions in the brain. Perturbation of the system and observation of its response is an experimental method that can be used to study effective connectivity (Massimini et al., 2009). An alternative method for investigations of effective connectivity is dynamic causal modelling (DCM). DCM is an analysis technique which creates a biologically plausible mathematical model attempting to explain how the observed signal is generated within the brain by changes in neuronal regions and their effects on activity in other regions (Friston, 2009). DCM can be used to analyse connectivity from EEG or fMRI data. For the purpose of this review, findings from brain stimulation studies are primarily considered, as they provide a distinct experimental method allowing researchers to infer causal interactions in the brain without the reliance on correlational imaging data. They involve experimental manipulation in which the EEG data are used as a dependent variable. Massimini and colleagues (2005) conducted an experiment using simultaneous transcranial magnetic stimulation (TMS) and high-density EEG (HD-EEG) to record brain responses to perturbation during SWS compared with wakefulness. TMS is a means of stimulating a specific cortical area non-invasively by delivering pulses of magnetic stimulation using a coil placed directly above the area of interest. The pulse excites cortical neurons underneath the coil (Hallett, 2007) and by recording the cortical response using EEG, the method allows direct examination of the influence of this stimulation on cortical connectivity while other influences are under experimental control (Lee et al., 2003; Massimini et al., 2005). TMS was applied to two different cortical areas across six participants in wakefulness and NREM sleep. In wakefulness, TMS induced an initial wave of activation in the area under the coil, followed by a complex pattern of high-frequency, low-amplitude waves, as activation spread from this area along its anatomical (both transcallosal and ipsilateral) connections. This activity lasted for about 300 ms from TMS pulse application. On the onset of NREM sleep, the initial response became greater in amplitude but the overall response had a shorter duration. A significant change to the pattern was observed in SWS, where the initial response was a wave of large amplitude, spatially confined to the region of the TMS pulse and lasting longer than in previous conditions. After this dissipated, no further activity was observed. No fast oscillations were present and all activity ceased by 150 ms from pulse application (Massimini et al., 2005). The reduced activity was observed in both stimulated areas across all subjects. The result suggests a breakdown of information transmission in the brain in SWS (see Figure 2), which was hypothesised by the authors to be involved in the fading of consciousness in NREM sleep. This is also in agreement with studies finding reductions in large-scale functional connectivity in deep sleep (Spoormaker et al., 2010). A schematic representation of the spread of activation in the cortex following TMS in NREM sleep and wakefulness. The cross marks the site of TMS application, arrows indicate the spread of activation through the cortex (as measured by EEG, colour-coded by time elapsed from the TMS pulse). While in wakefulness TMS triggers a response of a complex pattern that spreads through a large cortical area, in NREM sleep the TMS-evoked activity only lasts for a short time and does not propagate beyond adjacent cortical areas. Adapted from Massimini and colleagues (2005), with the author’s permission. TMS was also shown to induce slow waves, which were nearly identical to those observed naturally in SWS, when applied with increased intensity in S2, S3, or S4 (Massimini et al., 2007). This effect can only be obtained in deep NREM sleep and Massimini and colleagues (2007) argue that the underlying slow oscillation could be the mechanism responsible for both breakdown of connectivity and the fading of consciousness. The possibility of inducing slow waves in sleeping subjects may have practical uses, for example increasing sleep depth and mediating the restorative function of NREM sleep, although so far this is only hypothetical (Massimini et al., 2007). A subsequent experiment, using the same technique, showed that effective connectivity is restored in REM sleep, in which there is a high proportion of conscious content (Massimini et al., 2010). This further supports the prediction that interactions between cortical areas are necessary for the generation of conscious experience. Similar results to those seen in NREM sleep were obtained in some disorders of consciousness (Rosanova et al., 2012; discussed below) and in general anaesthesia (Ferrarelli et al., 2010); this has led to the suggestion that a breakdown of effective connectivity is characteristic of states of reduced consciousness in general (Massimini et al., 2010). Additional support for this idea comes from the finding that the activity of cortical neurons appears to be highly synchronised in the anaesthetised brain, similar to the state they are in during SWS (Supp, Siegel, Hipp, & Engel, 2011). This is shown by ongoing low-frequency activity in the EEG signal during progressive loss of consciousness following the administration of increasing doses of a general anaesthetic (Supp et al., 2011). Synchronous firing therefore appears to be a common phenomenon in these two conditions characterised by diminished consciousness. Apart from the necessity for noise masking (the TMS coil generates a noise when delivering a pulse, but this can be overcome by having the participants wear noise-cancelling headphones; Massimini et al., 2005), another issue is the EEG signal, which has very good temporal, but lower spatial resolution compared to fMRI (although EEG signal source localization was performed by constructing a computerized model of the head; Massimini et al., 2005). TMS for the study of effective connectivity at various levels of consciousness has not yet been employed using simultaneous BOLD fMRI (Tagliazucchi et al., 2013c), which would allow better spatial resolution. There are suggestions that the lack of cortical response in deep sleep does not provide substantial evidence for the relevance of effective connectivity to consciousness, as there could be other mechanisms responsible for the different responses to TMS in different states (Miller, 2005). However, as mentioned above, results indicating a breakdown of effective connectivity in states of reduced consciousness were obtained in multiple studies, are in agreement with their theoretical basis (Massimini et al., 2005), and are supported by studies of functional connectivity that point to reduced integration between brain areas in deep sleep (Spoormaker et al., 2010). TMS/EEG has been of use in establishing the level of consciousness in unresponsive patients who suffer from disorders of consciousness (Boly et al., 2012a; Rosanova et al., 2012). The brains of patients in the vegetative state and coma (conditions in which consciousness is thought to be absent; in the vegetative state, the patient appears awake but there are no signs of awareness; Laureys et al., 2002) responded to TMS in the same fashion as the brains of subjects in deep NREM sleep (Rosanova et al., 2012). In patients with locked-in syndrome (a condition in which the patient is fully conscious but cannot communicate or generate a motor response; Laureys et al., 2002), or those in a minimally conscious state (following recovery from a vegetative state), the response to TMS resembled that of awake subjects in the previous TMS/EEG experiments (Rosanova et al., 2012). This distinction brings about a potential improvement in diagnosis as disorders of consciousness are difficult to diagnose and are believed to be frequently misdiagnosed due to the inability to communicate with the patient (Laureys et al., 2002). The absence of sensory awareness in some disorders of consciousness has also been found to serve as an indication of a patient’s level of consciousness. Boly and colleagues (2011) conducted an EEG study comparing activation following the presentation of auditory stimuli in vegetative and minimally conscious patients and healthy controls. Similarly to the activation following TMS, activation in healthy subjects lasted significantly longer than in the vegetative state, with activation in the minimally conscious state being between the two. DCM of the EEG signal showed that the main difference lies in top-down connectivity, i.e., the connections from higher-level cortical areas back to lower-level sensory cortices; lower-level regions are activated by stimulus presentation regardless of consciousness level (Boly et al., 2011). Top-down connections were impaired only in the vegetative state. Therefore, there seems to be a correlation between the strength of top-down connectivity and the level of consciousness (Boly et al., 2011), at least in disorders of consciousness. The presence or absence of this top-down connection may be sufficient to distinguish a patient in a vegetative state from one in a minimally conscious state. This specific connection has yet to be investigated in sleep. The most recent development in this field is the introduction of the Perturbational Complexity Index (PCI) by Casali and colleagues (2013). This is a measure derived by quantifying the EEG response to TMS, and is calculated using a data compression algorithm, capturing the complexity of the spread of TMS-evoked potentials through the cortex. The PCI has significantly higher values in wakefulness than in states with loss of consciousness such as deep NREM sleep, general anaesthesia or the vegetative state. In the minimally conscious state, the PCI has intermediate values. In patients suffering from locked-in syndrome, the index is as high as in healthy awake subjects, a strong indication of full consciousness experienced by these patients (Casali et al., 2013). The PCI is an improvement over previous TMS/EEG measures, which are not always able to detect smaller graded changes in the level of consciousness (Rosanova et al., 2012). The authors suggest that it could potentially be used as an objective measure of consciousness level. At the moment, however, the TMS/EEG set-up is still too complicated to be employed regularly at the bedside of patients in clinical settings (Boly et al., 2012a). While the TMS/EEG studies show evidence for the association between effective connectivity breakdown in the thalamocortical system and loss of consciousness during NREM sleep (suggesting that the ability of cortical areas to integrate information is a requirement for conscious experience; Massimini et al., 2005), the relationship between functional connectivity changes and consciousness level is not so clear. At present, it appears that the loss of consciousness in NREM sleep is associated with decreased frontoparietal connectivity and decreased functional integration in the cortex, especially during SWS (Sämann et al., 2011; Spoormaker et al., 2010). Studies have shown that individual resting-state networks such as the DMN are generally preserved but their connectivity is subject to sleep-stage-dependent changes (for example Horovitz et al., 2009). Both theory and research, however, suggest that the mechanism important for maintenance of consciousness is not individual network connectivity but rather connectivity on the larger scale of the entire thalamocortical system. The cortex adopts a more modular structure in deep NREM sleep, meaning that its different regions do not interact as efficiently as in wakefulness and REM sleep (Boly et al., 2012a). This is consistent with IIT, according to which interactions between thalamocortical regions are crucial to conscious experience. Connectivity appears to be reorganised during deepening NREM sleep, compared to light sleep, REM sleep and wakefulness. There are still discrepancies concerning functional connectivity changes in light sleep where results have been inconsistent, although a role for the thalamus in these changes has been suggested (Spoormaker et al., 2010). As functional connectivity measures can primarily give information about correlations (Lee et al., 2003), there is agreement on the growing need to further investigate effective connectivity in order to establish the causal relationships between the interactions of different brain areas and levels of consciousness (Heine et al., 2012). I am grateful to David Carmel for helpful comments and discussions. Laureys, S. et al. (2002). Brain function in the vegetative state. Acta neurologica belgica 102: 176–185. Moser, D. et al. (2009). Sleep classification according to AASM and Rechtschaffen & Kales: effects on sleep scoring parameters. Sleep 32: 139–149. Steriade, M., Timofeev, I. and Grenier, F. (2001). Natural waking and sleep states: a view from inside neocortical neurons. Journal of neurophysiology 85: 1969–1985. Stickgold, R., Malia, A., Fosse, R. and Hobson, J. A. (2001). Brain–mind states: I. Longitudinal field study of sleep/wake factors influencing mentation report length. Sleep: Journal of Sleep Research & Sleep Medicine 24: 171–179. Suzuki, H. et al. (2004). Dreaming during non-rapid eye movement sleep in the absence of prior rapid eye movement sleep. Sleep 27: 1486–1490.